Iran’s President Mahmoud Ahmadinejad is due to make a visit to southern Lebanon, close to the Israeli border. He is on the second day of a state visit that has been called provocative by Israel, the US and some Lebanese. 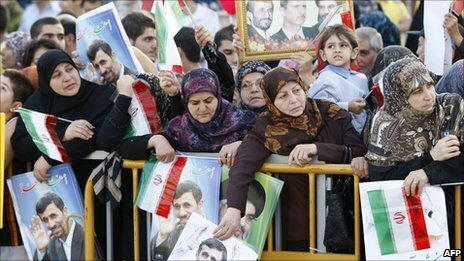 On Wednesday, Mr Ahmadinejad was greeted by large crowds and attended a rally organised by Hezbollah. He praised Lebanon for “resistance to the world’s tyrants”. But he also said Iran supported a strong, unified Lebanon. Iran contributed heavily to the cost of rebuilding villages destroyed in the south during the 2006 war between Israel and Hezbollah. The border area between Lebanon and Israel is rarely without tension. In August, two Lebanese soldiers, a Lebanese journalist and a senior Israeli army officer were killed in a clash sparked by the trimming of a tree on the Israeli side of the frontier. During his tour of the south, Mr Ahmadinejad is due to visit Bint Jbeil, a Hezbollah bastion, and Qana, the site of deadly Israeli air strikes in 1996 and 2006. Mr Ahmadinejad’s motorcade was showered with rice and flowers on its way from Beirut airport to the presidential palace on Wednesday. “We support a strong and unified Lebanon. We will always back the Lebanese government and its nation,” he said, standing beside President Michel Suleiman. But he said Iran stood ready to help Beirut confront any Israeli aggression. The next stage of the Iranian leader’s controversial visit is to Hezbollah strongholds in southern Lebanon – an act described by Israel as a commander reviewing his troops and the transformation of Lebanon into an Iranian protectorate. Mahmoud Ahmadinejad was earlier among friends at the huge rally of flag-waving Hezbollah supporters in Beirut’s southern suburbs – listening to patriotic music praising the Shia movement’s clashes over the years with its avowed enemy – Israel. He had basked in similar scenes of adulation as he arrived at Beirut airport on this state visit – his image and that of Iranian religious leaders flanking the road to the city centre. But many inside Lebanon and outside see this trip as nothing short of inflammatory – upsetting Lebanon’s fragile political system and provoking another conflict with Israel. Calls from some to calm the rhetoric fell on deaf ears as Mr Ahmadinejad and Hezbollah’s leader, Hassan Nasrallah – appearing via video link for security reasons – addressed the crowd. “We will surely help the Lebanese nation against animosities, mainly staged by the Zionist regime,” he said, in reference to Israel. Many Lebanese are alarmed at the visit, as Iran backs Hezbollah, the powerful Shia Islamist group whose war with Israel left 1,200 Lebanese and 160 Israelis dead. Speaking during a visit to Kosovo, US Secretary of State Hillary Clinton said Washington rejected any efforts “to destabilise or inflame tensions” in Lebanon. “We would hope that no visitor would do anything or say anything that would give cause to greater tension or instability in that country,” she said. Members of Lebanon’s Western-backed parliamentary majority have called the visit a provocation, saying Mr Ahmadinejad was seeking to transform Lebanon into “an Iranian base on the Mediterranean”. Israel accuses Iran of supplying Hezbollah with weapons, but officials close to the group stress instead the Islamic Republic’s support for reconstruction. They say they have spent about $1bn (£0.6bn) of Iranian money since 2006 on aid and rebuilding. “Ahmadinejad has done a lot for Lebanon, we are here to thank him,” 18-year-old engineering student Fatima Mazeh told the Associated Press. But elsewhere in the country, Hezbollah and its patron are viewed with suspicion by some. The state visit also comes amid tension over a UN inquiry into the 2005 assassination of the former Lebanese Prime Minister Rafik Hariri. The UN tribunal is believed to be close to issuing indictments, including ones naming members of Hezbollah. Prime Minister Saad Hariri is under pressure from Hezbollah and Syria to denounce the inquiry into his father’s death.